People Are Excited About CGMS! If you would like to speak with a CGMS student or alumnus, let us know. In the meantime, we invite you to read what people are saying about our programs. I am really enjoying the Elementary online program! I am finding the videos, readings and assignments very informative. It is exciting that I have the opportunity to take what I am learning and apply it in the classroom. I am truly happy with the choice of programs that I made! I can not wait to complete it and then earn my Master's. The Special Needs course was great! This course was great and I'd do it again in a heart beat! The Center for Guided Montessori Studies has provided an individualized program to meet the needs of the staff as we transition from a traditional to a Public Montessori School. The Instructional Guides are knowledgeable and supportive. They provide guidance and inspiration to the students on an ongoing basis. The quality of this Montessori distance learning program is exceptional. The cohort model you have developed for us has made a positive difference for our Montessori Guides. I had high expectations and all were met. I never had a problem knowing what is expected of me, and the instructions and expectations were clear and to the point. I loved the pace... It just felt like a normal part of my day. The moodle is great... The videos are good and informative. The technology is great from my point of view. I must honestly say I love and enjoy the program. Comparing the things I learn with "the real world", I can tell that the program does offer us a high quality education. The teachers in my classroom had a look at my Practical Life Album the other day, and they were in awe. They asked me to show them the other albums as I receive them as well. From a student perspective I must say that despite the fact that the course is a lot of work, the program is interesting and a lot of fun. It is much more than I would have ever expected to find in a Montessori distance learning study course." It was well worth time, effort, and cost! This course has exceeded my expectations of a Montessori training program. It’s a lot of work with a lot of important information. The instructional guide was always available through the moodle and email. The instructional guide would often post comments to my forum answers and my journal. I would also sometimes get questions back that extended my view and pushed me to think a little more. During scheduled chats, the instructional guide would stay on task, direct the chat, as well as keep up with our many questions. Navigating the course became comfortable after a few weeks of practice. Personally, I am very comfortable and thoroughly enjoy the concept of receiving all this information online. I have the freedom to choose when to view my lectures and when to complete assignments. I am also able to pause the lectures to take adequate notes or rewind when I don’t understand a concept. 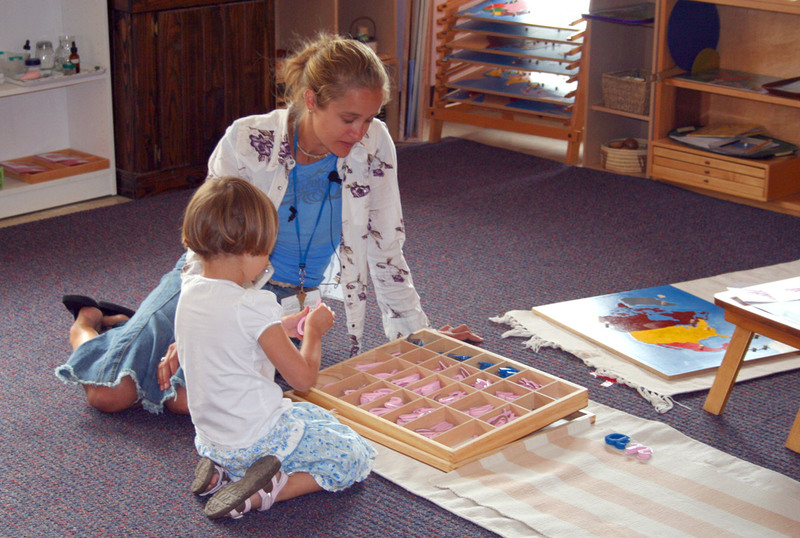 I feel confident that I have learned A LOT about the philosophy behind the Montessori method. It has been an adjustment for me to go back to school...let alone go back to school ONLINE! I never thought I would do anything like this. It is fun though, and very convenient. I LOVE the flexibility! I love all the different ideas and comments that our cohort posts on the moodle. In college I was a quiet learner, but with this online course it is imperitive to post your comments for all to see….at first this made me nervous, but now I like that I get to read what everyone else is thinking. I think it makes the ‘conversations’ more diverse and interesting. It has been thorough, organized, and clear so far. I put in about an hour a day online (5 days a week) for it plus time making materials. The lessons are presented sequentially, in short videos accessed online. Each lesson begins with an introduction to the material, it's purpose, and when and to who to present it to. After the introduction, there is another short video of the presentation being given to a child. What I've been gaining so far, is a sequential understanding of art theory and studio techniques broken down and made accessible for children of different ages. I'm feeling confident in what I'm learning and am sure that it will translate nicely into my classroom next year. A cool technological experience was our first online meeting yesterday- with course students from all over the world coming together in a chat room to discuss relevant topics.